If there is one thing that kids like more than watching TV or riding their bikes/scooters, its playing with dirt. 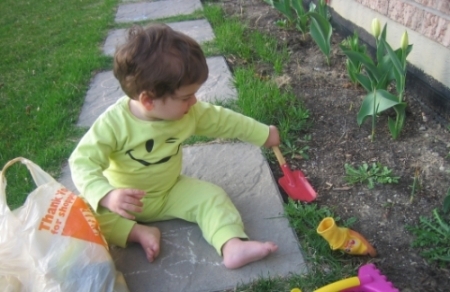 As a husband and father who loves to plant and take care of the garden, I couldn�t even begin to start the gardening process without involving my kids. And if your thinking that your kid is only 15 months old and doesn�t really know a thing about gardening and therefore why bother, well once you get down on the ground and start digging up that earth your one and a half year old would be more than happy to join you. 1. 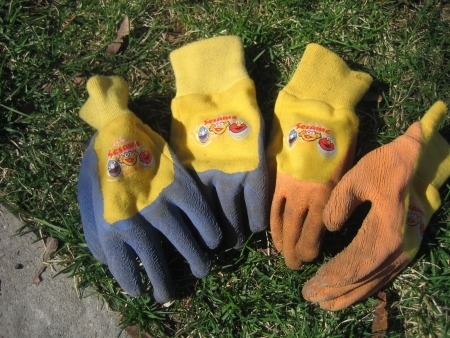 Buy them cute work gloves – I found these at the local garden center. When I brought them home they couldn’t wait to try them on and get dirty. 2. Buy them gardening tools – Make sure that while the tools are designed for kids they have some strength to them. Some of the plastic colorful ones are actually stronger than the metal ones with wooden handles. 3.Get the right things to plant – Remember, your kids dont have to plant everything with you and most probably they wont be interested after the first half hour or so. So consider getting things that are easy for them to plant (See below). 4. Make sure they have their own kids sized watering can. If they are using one of yours they would have a hard time filling it up with water and carrying it to the flower bed. 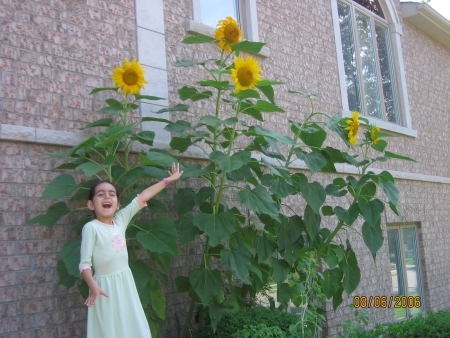 Seeds are great for planting with kids. The bigger the seeds the easier to plant. The special thing about planting with seeds is that when they pop up out of the ground the kids get really excited watching them grow. 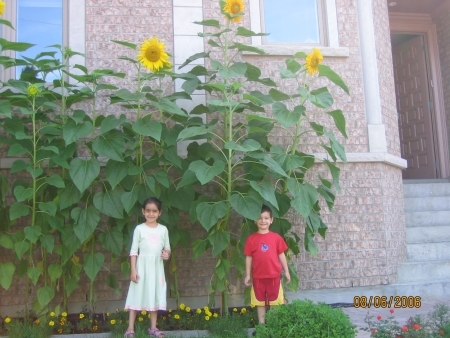 Last summer we had incredible success with sunflower seeds. I bought seeds for mammoth sunflowers at the local grocery store. The packet read that the maximum height was 8 � 10 feet. We couldn�t believe it when we saw the results. Here’s a closeup shot of one of them. This has to be one of the best pictures I’ve ever taken. These seeds were very easy to plant as well. I handed the seeds to the kids and all they had to do was push the seed into the ground. 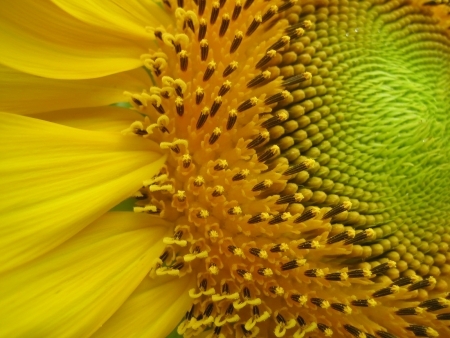 One thing people should be aware of with sunflowers is that they need lots of sun. So if the area your planting doesn�t have tons of sunlight for most of the day then they might not grow well. Give it a try anyway. A packet of sunflower seeds cost only about $1.50. Planting in the Fall may be easier than planting in the spring but the results wont show up until the spring. The best and easiest thing to plant in the fall are tulip and other bulbs. Pay Home Depot or your local garden center a visit in the fall and you�ll see bags of 30 or more tulip bulbs for under $10. Many people wait until the spring to plant tulips and often pay a lot more than $10 for 30 � 50 tulips. 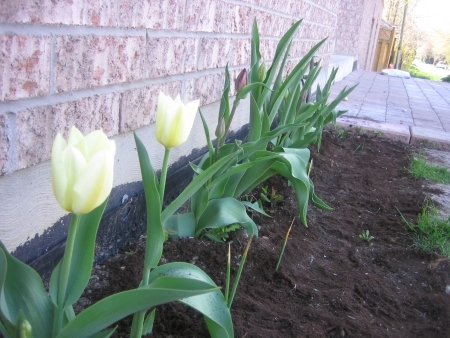 Last year I found an extremely fast and easy way to plant the tulip bulbs with my kids. I had my daughter in charge of the bag of bulbs and all I had to do was ram the trowel in the ground and move the earth over slightly enough for kids to be able to drop a tulip bulb in facing upwards. Then I would pull out the trowel and have them push the ground back in place. It literally took less than ten seconds to plant a bulb. We are just now seeing the results of our planting in the Fall. Previous story No Diaper/Change Pad? No Problem.